University of Colorado Health Sciences Center, Denver, CO 1991-1995 M.D. While Dr. Chang performs all types of cutaneous surgeries, he is specially trained in Mohs micrographic surgery for the treatment of skin cancers. 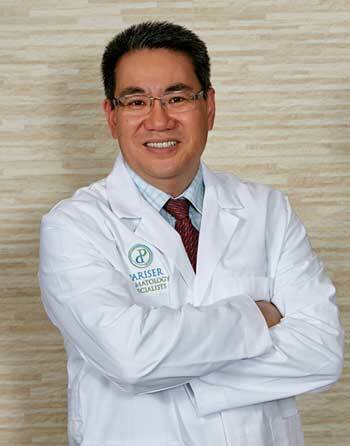 Dr. Chang is dedicated to his practice and his patient’s care. He takes pride in the quality of care he provides and his availability to his patients. While working at Pariser Dermatology, he has gained the respect and admiration of both his colleagues and his patients for his surgical expertise, clinical judgement and work ethic. Dr. Chang resides in Virginia Beach with his wife and 2 children and enjoys gardening and spending time with his family. He speaks Mandarin Chinese and Korean. "Time after time, Dr. Chang and the entire staff at the Newport News office are the most professional and efficient I have encountered. While Dr. Chang moves quickly from patient to patient, I have full confidence that when he is with me, he has complete control and focus on my healthcare. I drive over an hour to receive his services, and I have never been disappointed." "The staff was amazing!! Very upbeat, kind, explained everything. Dr. Chang walked in and introduced himself. He sat down next to me and explained what the treatment was going to be step by step. Very impressed with this practice. I would totally recommend them to anyone." "Most impressed with Dr. Chang!" "Confident. Easy to talk to and understand answers. Smiles everywhere"
"As of now I am very impressed with what has taken place. Very efficient and professional." "This was the most efficient doctor's office visit. The staff was helpful, the appointment time was kept (right on the minute), and Dr. Chang and his assistant answered all of my questions concerning my upcoming procedure. I was very impressed with the entire visit. "